All of us have some issues relating to the workplace, patient care, health and wellness within our communities or the healthcare system that we are passionate about and wish we could change for the better. We might believe that it is not within our ability or power to bring about change. However, through well planned and executed advocacy we CAN make a difference while still remaining within the boundaries of professional ethics and workplace policies. Nurses are by far the largest group in health care. With their education and exposure to the needs of patients and the community, as well as being recognised as the most trusted and ethical profession, they should be a major force for social change. ◉ The nurse shares with society the responsibility for initiating and supporting action to meet the health and social needs of the public, in particular, those of vulnerable populations. ◉ The nurse advocates for equity and social justice in resource allocation, access to health care and other social and economic services. Initial involvement in advocacy need not be a major project; it can be as small as motivating for a suitable breastfeeding room for staff or healthier food choices at the local school canteen. Participation in advocacy initiatives also leads to personal and professional development, including growth in leadership and communication skills, as well as empowerment for all concerned. 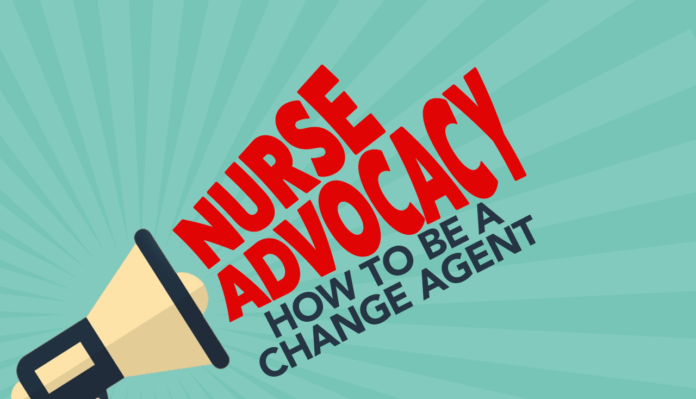 The first step in advocacy is to make the decision to act. This could be you alone or a group who all feel strongly about the problem. The particular issue must be defined and framed as one for which there is a potential solution, within the framework of available support and resources. Using the above example of the breastfeeding room broad the felt problem might be that staff who want to feed their babies have to use the toilets. The issue is then framed by the need for a clean and comfortable place where staff can breastfeed, given that breastfeeding is the healthiest option for babies and should be encouraged. Once the issue has been framed in-depth, research must be done to collect evidence which will help to build a strong, credible case. This information gathering would include the most recent scientific research related to the issue; views expressed by international organisations; the number of people affected and their ideas about the problem and possible solutions. Research must also include the political context–find out who the people in high places are that make the decisions about priorities, changes in policy and funding. What other influential leaders or organisations could be approached for support? What are others saying and doing about the issue? What coverage is being given to the media – both positive and negative? Who are the possible opponents and what are their points of view. Once as much information is possible has been collected the next step is to set a goal for the campaign. As for all goals, it should be specific, achievable, have a measurable outcome and a time frame. Smaller institutional or local campaigns might have a short period, whereas, for others, the goal might take years or even decades to achieve (for example, the action against global warming). Once the goal has been decided on, a strategy can be planned on how to achieve it. This planning is the most important part in ensuring the success of the campaign. Communication is at the centre of all advocacy – getting the message out there, gaining the support of stakeholders and the public and putting pressure on decision makers. Stakeholders who will be affected by the action should be involved as soon as possible in the advocacy process, not only for their personal knowledge and experience of the issue but also to get their buy-in and support. There should be a strong key message with a call to action which should preferably be supported by a visual such as a logo or a “face” on the issue. Specific information packages can then be developed to target different audiences such as the stakeholders and the public; the media; and decision makers. The who, what, why, when, where and how of putting the message out there must be planned in detail. Where the campaign addresses a community issue, communication through the media will be essential. Win the media over as a partner in the campaign by building a relationship with journalists in the print media, radio and television. Identify a spokesperson for the campaign who will come over well in interviews. Stakeholders who can be talked about their personal experiences can add a compelling human interest angle. Internet-based and social media campaigns are cost-effective and can reach large audiences very quickly but should not be used on their own. Lobbying influential leaders and policy makers, meeting with them and presenting the facts and figures and possible solutions must also be included in the plan. It is also a good idea to network and form alliances with organisations that have similar goals to provide for information sharing and mutual support. There is always power in numbers. After careful planning, the campaign is ready to be implemented. This is also the time to be alert and watch the news as it unfolds. With fast action, the campaign message can become newsworthy when linked to relevant breaking news. For example, if the danger of childhood obesity makes the news after a government report is released, it can support the campaign for healthier foods in the school canteen. There should be continuous evaluation and adjustment of the plan as needed as well as final evaluation at the conclusion of the advocacy campaign.This is essential for accountability, especially where donor funding was involved. How successful was the campaign? What were the strong points and what could have been done differently? Methods used for evaluation will depend on the goal of the campaign. It might be as simple as that the change has been implemented or might require surveys and relevant statistics.